If you’ve been studying any materials related to an upcoming Legacy auction, you’ve likely noticed that there is an advertised buyer’s premium. But what exactly is a buyer’s premium, and how does it impact you as a bidder? The buyer’s premium is used to cover auction expenses. 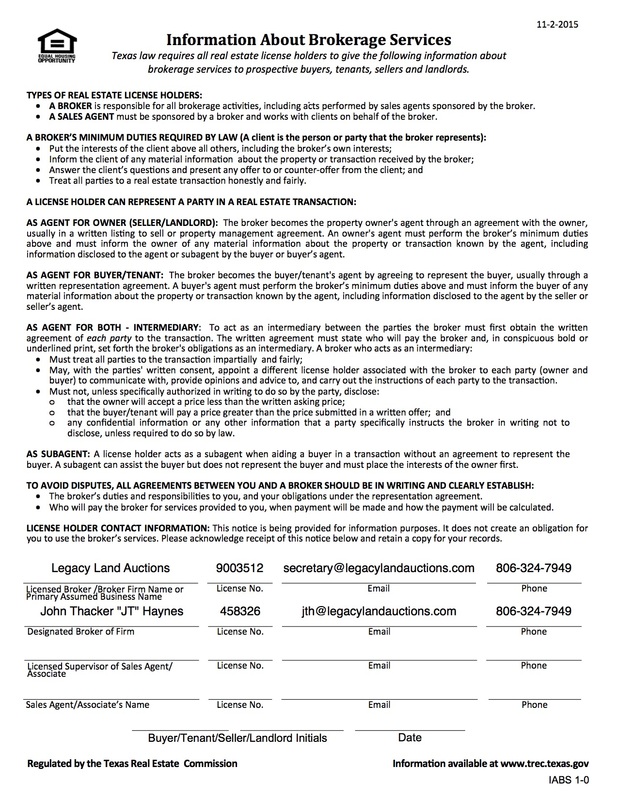 Typically 10% at a Legacy auction, the buyer’s premium is added to the bid price to calculate a final contract value. If for example, you are the successful bidder on a tract with a high bid of $100,000, then the final contract price will be calculated by adding 10% to this high bid ($100,000 x 1.1 = $110,000). So, the final contract price reflected on the sales contract will be $110,000. As a successful bidder, you will be expected to sign a sales contract at the close of the auction and deposit a non-refundable 10% earnest money deposit with the closing agent at that time. So, your earnest money deposit on the above contract is 10% of $110,000, or $11,000. As you consider your bidding strategy for an upcoming Legacy auction, you’ll want to incorporate this buyer’s premium into your calculations. For instance, if the highest price you’re willing to pay for the 320 acre - Tract X is $1,000 per acre or a total of $320,000, then you want to work backward to determine your maximum bid. In the above example, that would look something like ($1,000 ÷ 1.1 = $909.09). So, you’re high bid to stay within the above budget will be roughly $909 per acre or a total bid of $290,880. At Legacy Land Auctions, we are committed to ensuring all bidders are fully prepared for the process on auction day. If you have any questions, please contact us at 806-324-7949.